Puzzles, ships and treasure ahoy, landlubber! Play match 3 games on a treasure hunt with the bravest pirates on the high seas in Pirates & Pearls®! Plunder yer way through hundreds of match 3 puzzle levels filled with precious loot. Solve puzzles, build ships, pillage wealthy ports and construct gold mines while perfecting yer match 3 and buccaneering skills. Matching games be yer first task. Match 3 gems to complete the level before ye run out of moves and must walk the plank! Solve puzzles by using and combining special boosters and power-ups. Hundreds of match 3 game levels lie ahead, complete with boatloads of pesky obstacles and special puzzle-solving tools. Solve puzzles on a treasure hunt alone or play with yer mates to increase yer haul. Match 3 puzzles and great plunder await - think ye to be a real swaggering pirate? Then weigh anchor and hoist the mizzen when ye download Pirates & Pearls! Solve match 3 puzzle games, plunder treasure and become the most fearsome pirate on the seven seas! Download Pirates & Pearls today! 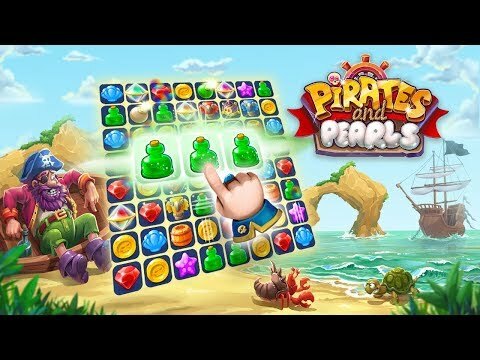 Pirates & Pearls - A Match 3 Pirate Puzzle Game © 2017 - 2019 G5 Holdings Limited. Published by G5 Entertainment AB.